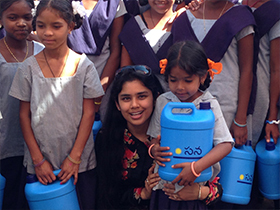 Managing the most precious element of earth WATER and ensuring sanitation for all. This has been SANA’s mantra. Safe drinking water and access to toilets is a fundamental human right. It changes the way we live and it restores dignity to the community. 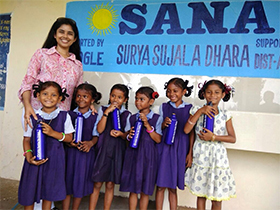 Winner of the Google Global Impact Challenge 2013 for its innovative use of green technology for social impact, SANA is a registered nonprofit with FCRA registration. 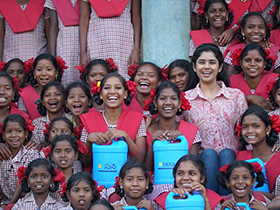 SANA provides safe drinking water and sanitation using green technology. SANA "trains the trainers" through regular workshops on the importance of hygiene & sanitation. SANA co-opts Self Help Groups & Asha workers from within the village to help spread awareness. Local technicians are also trained on the maintenance and upkeep of both the water stations and bio-toilets. Apart from motivational workshops & capacity building programs SANA conducts regular social audits using the trainers and volunteers from near by schools and colleges. 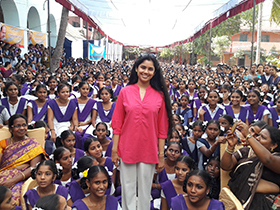 With footprints in over 35 sites in Visakhapatnam District & Delhi, SANA’s work is also supported by IT giant Oracle and the local government. In 2015, SANA in partnership with the Delhi Government converted sewage waste into safe drinking water, endorsing recycled water. SANA’s Founder & Managing Trustee Sanchaita has been invited to address various national & international fora to share her work & vision. She has spoken in the UNESCO HQ in Paris in 2016, The Women In the World Summit In association with The New York Times in the Lincoln Center New York in 2015 & New Delhi in November 2015. Sanchaita was selected as among “Women of Pure Wonder” by the Vodafone Foundation 2016. Recently SANA’s work was acknowledged as semi-finalist in the prestigious Buckminster Fuller Challenge 2017.